It has taken me a while to figure out what I want to say about this book. Hausfrau tells the story of an American woman named Anna living in Switzerland with her Swiss husband. They have 3 children and she is a housewife. She is lonely and depressed; she feels isolated, and neglected by her husband. A recipe for disaster. As I was reading Hausfrau, I was captivated by the writing and style of the narrative. I like the way the story jumps around between past and present, German lessons and visits to the psychoanalyst. The psychoanalyst, in particular, offers us many things to mull over as we read the book. But, when I got to the end of the book, I felt disappointed that there wasn’t more to the story. I felt like I had read this story before, several times. Two books that quickly come to mind are Mme. Bovary and Anna Karenina. But, maybe there is a reason why we are still eating up books like Mme. Bovary, Anna Karenina, and Hausfrau – we are still finding in them things that resonate with us. I think Hausfrau is a good example of how some women still feel dependent on men, and find it hard to break away. So, Anna’s passivity had merit. It was useful. It made for relative peace at the house on Rosenweg. Allowing Bruno to make decisions on her behalf absolved her of responsibility. She didn’t need to think. She followed along. She rode a bus that someone else drove. And Bruno liked driving it. Order upon order. Rule upon rule. Where the wind blew, she went. This was Anna’s natural inclination… If Anna suspected there was more to her pathology, then that was a secret she kept very close. Maybe by reading these books, we can ask ourselves what we can do to prevent finding ourselves in the same situation. In the case of Hausfrau, Anna finds herself in a country whose language she hasn’t yet mastered, married to a man who doesn’t pay enough attention to her. She has no family and few friends. She turns to unhealthy ways of coping with her loneliness. Her friend Mary turns to food, while Anna prefers infidelity. It’s also interesting to read about different people’s ways of coping – some are more disastrous than others. Anna’s talks with the doctor were eye-opening, both because of the things that were said as well as the things that were unsaid. Anna’s character/personality/issues would make for a good discussion in a book club. Some would say she is unlikeable, but I mostly just felt sorry for her. At the sound of Bruno’s door clicking into place, something in Anna slammed shut too. A closed door reminded her of everything about her life she hated. And she hated it twice as much as she had the day before. The brief vacation from heartbreak made the desolation that remained all the more acute. Another character I think would be interesting to hash out is Mary, the friend Anna met at her German classes. Mary has just come to Switzerland from Canada, and for the most part appears to be content with her life. But, there are little things she does and says that hint at her own misgivings about the way her life has gone, or the way she feels about herself. Despite the fact that I come across sounding hesitant about this book, I did enjoy it and would recommend it to others. Just don’t expect anything to happen that you don’t see coming, or any big secrets that you haven’t already guessed at, and you’ll be fine. There are too many good things about the book to give it a pass; the writing, the structure, the social commentary, the psychoanalysis sessions, the exploration of a difficult marriage. It’s an otherworldly moment when the curtains behind which a lie has been hiding are pulled apart. When the slats on the blind are forced open and a flash of truth explodes into the room. You can feel the crazing of the air. Light shatters every lie’s glass. I enjoy reading books about marriage, but there are so many more about bad or difficult marriages than good ones. I guess it must make for better reading, or, depressingly, more people are probably able to relate to the difficult ones. But, since we’re on the topic, who can recommend a good book featuring a happy marriage? One that I can think of that I have read recently is Love Letters of the Angel of Death by Jennifer Quist. Are there others out there? And, if you have read this book, what did you think? 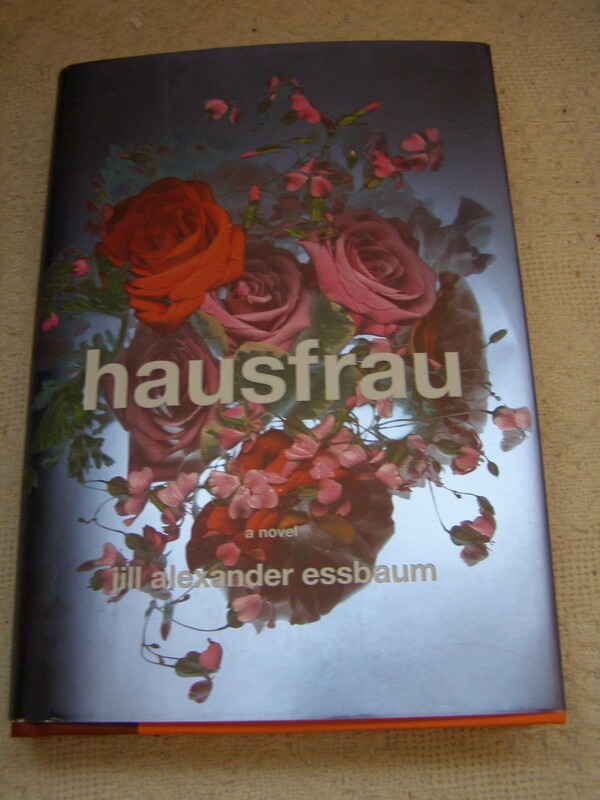 Shannon at River City Reading suggests that if you like Hausfrau, you might also like watching The Affair. Andi at Estella’s Revenge is calling it ‘meh’. Amanda at Gun In Act One gives it 4.5 stars. *Thanks to the publisher for sending me a review copy of this book in exchange for an honest review! Mmm, sounds a bit so-so? Now you’ve got me thinking about happy marriages in literature and my mind is a blank! Unhappy ones are so much more dramatic I assume! I would say it is a good read as long as you aren’t expecting something unexpected, like I was for some reason. Except for that one book that I have read recently, my mind is also a blank on happy marriages. Unless I include children’s literature, like L.M. Montgomery’s Anne and Gilbert. I’m so on the fence about reading this one. I’d like to, but I don’t know if I want to, if that makes any sense. I think it’s mostly because of what you say: the subject matter might resonate with us, but it can be found in so many other books already. I don’t have any suggestions for a book with a happy marriage either. Maybe the one couple in Jojo Moyes’ The Girl You Left Behind, although WWI disrupts that marriage for a while and causes enough conflict to keep it interesting. If you are interested in reading about unhappy housewives, then I’d say you would want to read this book. But, if the subject depresses you to even think about it, then maybe not. If you are still on the fence about it, though, maybe it is helpful to know that it wouldn’t take you long to read it. Also, the psychoanalysis stuff was interesting. And, it would be fun to know what you think of it! Disrupting a marriage with some sort of conflict would keep readers interested. In fact, it wouldn’t be as interesting if it was disrupting an unhappy marriage, would it? This one sounds really interesting. I would probably like it given my love of Anna Karenina and Madame Bovary. I like what you said about discussing the characters at a book club. In my old book club (over a decade ago), the women responded harshly and judgmentally to a similar character from a book I had picked. They did not feel any compassion for her depression or neglect of her children. I hesitate to discuss these issues with anybody now because of that experience. In my opinion, this is a perfect book for a book club. There are so many things about it I would like to know what other people think, but can’t really talk about in my review without giving too much away. It’s too bad you had a bad experience at your old book club. You would think that people who read a lot of books would be more able to put themselves into other people’s shoes – that’s half the point of reading, isn’t it? I would have loved to have been there!This would actually be a good one for Literary Wives – maybe we could add it to the list at some point when it’s not so new anymore, so we can say what we really think. This book definitely deals with the same issues as classics such as Mme. Bovary and Anna Karenina. It’s so interesting to see how some things haven’t changed. Another good conversation for a book club! I still really want to read it. I’ve heard that the writing is marvelous. I should get to it in the nest two weeks or so. You should! I’ll be watching for your review to see what you think! A very interesting review, Naomi. I was somewhat curious about this one as it explores the ex-pat experience – various friends and family members have been in this situation. Having read your review, I don’t think it’s for me, but one of two of my ex-pat friends might be interested. Thanks for sharing your thoughts. I would be curious to hear how it compares with the experiences of other women who are living outside their own countries. Probably not as extreme (or, at least, I hope not), but possibly some similarities with the difficulties of fitting in/feeling somewhat isolated. I think you’re right about the story being one that’s familiar, but I thought the writing was really stellar. So much so, that Essbaum was able to make Anna a more dimensional character for me than other similar novels I’ve read. For some reason, when I read this book, I was expecting something different – some kind of deeper secret that I wouldn’t be able to guess at. But that didn’t happen, so I felt a little disappointed. I think that’s where my hesitation comes from. But, other than that, I found it very compelling, and thought the writing and the style were fantastic. And, I would love to sit down with someone and have a discussion about Anna! Naomi, In my fiction, I seem to end up writing stories about married couples, couples who don’t cheap on each other but stay together despite everything that gets thrown at them. Not everything I write follows this theme. But quite a few do. I find it is a theme that has endless possibilities. It fascinates me that two very different people can stay together and stick it out. I have a short story called “A Marriage” I am posting next Sunday. It’s about a couple that has been married for twenty years. It’s only 1400 words long but I think it represents a lot of marriages. Not necessarily with the specifics but with the struggle. You’re right – the subject of marriage lends itself to endless possibilities, which is one of the reasons I like to read about it. I’ll be watching for your story! You make an interesting point about books about happy marriages. I can’t think of any. I think Julian Fellowes said that happiness is hard to dramatise and I agree with him. I really liked this book (my review is going up this afternoon I think) but I think a lot of people will find it hard to relate to someone so self destructive. I agree that for the most part nothing about it was surprising but I still felt like it was effective. I think it’s been a missed opportunity for my book club – this one would have been GREAT to discuss. Oh, this would be a great book to discuss at a book club! All I wanted to do was discuss it to work out exactly how and what I felt about it. Which, really, is a good indication that it is a good book. It may be that not a lot of people will be able to relate to how self-destructive she is, but I think there is so much to her that many of us can relate to her in some way. For example, being a stay-at-home mother for so many years makes it easy for me to imagine how lonely it could be if you didn’t have family and friends around you. It would just escalate from there. I found I was more able to relate to Mary. She was happier, but she seemed to know how important it was for her to make a friend and get out of the house. Was it a difference of personality type, or mental illness that created such a huge gap between two different women in similar circumstances? Sorry, big question. See how great this is for a book club! I tend to agree. If I were to simplify it and guess the difference, I would probably go with mental illness. And, of course, some people are more prone to it than others. I watched this review yesterday and like yours, I get the sense that this is good, but… something missing. It kind of sounds like a boring-er verison of The Wallcreeper. I still wanna read it. That cover! Happy marriage stories are tough to find. I remember Ms. Quist recommended The Toss of a Lemon as one example, which has been sitting on my shelf for some months. Other than that, I just scrolled down my Books Read list on Goodreads back to beginning of 2014 and couldn’t find a single one. I definitely think you should still read it! I’d like to hear what you think. Like I said in a couple of other comments, part of my hesitation comes from the fact that I was expecting something a bit different (I don’t know where that expectation came from). I think the book would appeal to anyone who loves good writing and playing with words, and people who like to read about lonely housewives/marriage/infidelity and the meaning/questions behind all that. It’s a book that will make you think and question. I will have to go look up A Toss of a Lemon (I like the title!). And, thanks for the link – I liked her! This sounds like it wasn’t the most novel look at the topic of marriage, but I love the snippets of the writing you shared. It seems like the author is finding unique, relatable ways to describe how the main character feels. I am really fascinated with the premise of this otherwise common story, as I knew many frustrated and lonely expat wives when I lived overseas. I also like the heavy psychological element. I’m going to put it on my TR list at my own risk knowing the potential flaws (Carolyn also had mixed feelings about it – this should make for an interesting discussion!). As for your question, I honestly don’t know of any novels about happy marriages! Well, there is The Notebook (I only saw the movie and am otherwise not a Nicholas Sparks fan). I haven’t read it but I know that Crossing to Safety is about marriage…I don’t know the details though. Great review showing your range of feelings about the book! Thanks Cecilia! I do think you would like to read this book. Because, whether or not you actually like it, you will enjoy thinking about what it questions, and joining in the discussions that seem to be going on all over the place right now. I just left a monster comment on Carolyn’s review, but it does have a few spoilers in it. You might get even more out of it having had the expat experience – something I haven’t had at all. Oh, yes, Crossing to Safety is about a married couple, I think. Now I am curious to know whether it is happy or not. Thanks! I’m still on the fence about whether I want to read it; so many others to read. As for novels with happy marriages, you’ve stumped me. Leave It to Beaver? Jokingly I’ll say Revolutionary Road. Not! Ha! Yeah, I’m thinking happy marriages are only interesting to write about if the couple gets separated in some way, or comes up against some obstacle. I wonder what responses I would have gotten if I’d asked for the best book about an unhappy marriage? Revolutionary Road would be a great one for that. One good reason to read Hausfrau is that it’s fun to get involved in all the discussion about it right now. And, it doesn’t take very long! I love books that leave you feeling this way, just itching to chat. The one book that always comes to mind on happy marriages is Bonnie Burnard’s A Good House, because she commened in an interview once that she was motivated to write it for that very reason — the dominance of unhappy-marriage stories! I’ve read it three or four times and absolutely love its quiet beauty. Good one! I read that one so long ago that I had forgotten about it. In fact, I can’t remember much about it at all. This would be a good one for a re-read! I just got Hausfrau out of the library. We’ll see. These are nonfiction, but It strikes me that in Cheryl Strayed’s memoir, Wild, she was sleeping around though she was married, which was partly why she embarked on her redemptive journey on the PCT. So in that respect, it is fascinating to read a true story about someone who was able to confront her demons and change. Also, have you read This Is the Story of a Happy Marriage by Ann Patchett? It is a collection of essays, excellent, and at least one of her essays is a long one about her marriage, and it’s fascinating. I wrote about this book on my blog because Patchett is a favorite of mine. I haven’t read This is the Story of a Happy Marriage yet, but I would love to. I have read most of her other books. I loved Wild, for many reasons. Thanks for the suggestions! I hope you enjoy Hausfrau (or at least find lots of good things in it to talk about)!